Diademed sifaka, Propithecus diadema. Most of the sifakas you see pictures or film of are P. verreauxi, so I'll show you something different for a change. Photo from here. The Indriidae (sometimes, just to be confusing, spelt as Indridae or Indrisidae) is a family of lemurs found in (of course) Madagascar. 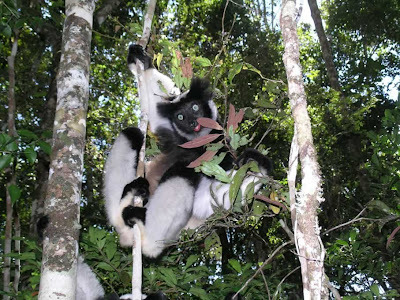 As generally recognised, the species of Indriidae are divided between three living genera, Indri (the indri), Avahi (the avahi[s]) and Propithecus (sifakas). Some authors (e.g. 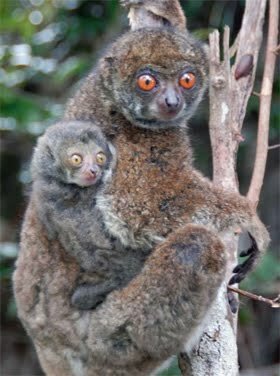 Marivaux et al., 2001) have included the bamboo lemurs of the genus Hapalemur in the Indriidae but most (e.g. Orlando et al., 2008) place Hapalemur in the Lemuridae. Also, two subfossil families of large lemurs, the Archaeolemuridae and Palaeopropithecidae, are closely related to the Indriidae and are included therein as subfamilies by some authors. The three genera of indriids are united by a number of very distinct features. Perhaps the most obvious is that they all have the hind legs significantly longer than the fore legs, as demonstrated in countless nature documentary sequences featuring sifakas. Because of this disparity in limb length, the normally arboreal indriids cannot walk on all fours on the ground and, when forced to cross open spaces, hop upright on their hind legs only with the fore legs held upright. Indriids will also often sit upright with their arms held up in the same manner, leading to an old story that they are sun worshippers. Also noteworthy is the indriid dentition which has fewer teeth than many other primates*: two (pairs of) incisors, one canine, two premolars and three molars above and the same below except for the absence of the second incisors or the canines (depending who you ask) (Nowak, 1999). All indriids are strict vegetarians. *When this post was originally put up I said that indriids had the lowest number of teeth for primates but a number of commenters below have pointed out my mistake. Avahi mooreorum, the most recently named of the Avahi species by Lei et al. (2008), from whence comes this photo. The number of species in the family has been the subject of much recent activity. 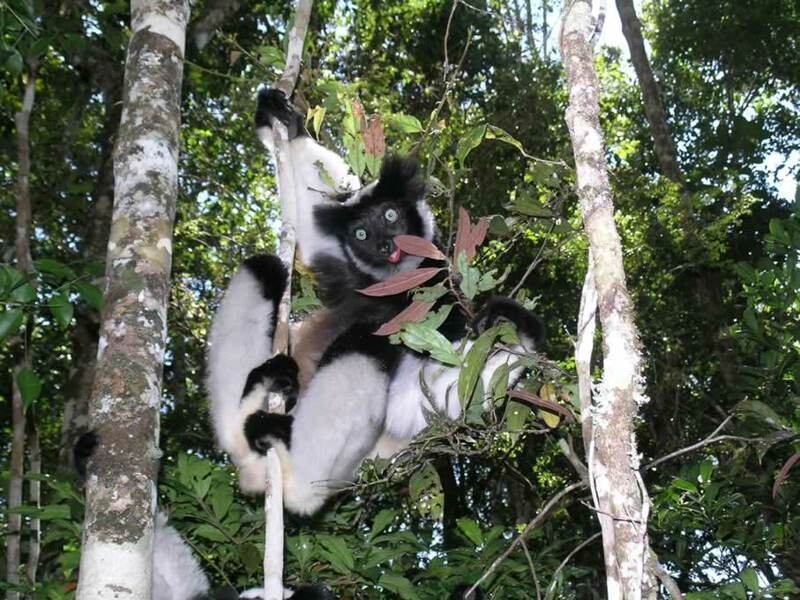 Nowak (1999) listed one species each of Indri and Avahi and three in Propithecus but recent publications and reviews have increased the number of species in Avahi and Propithecus to nine each (Mittermeier et al., 2008). 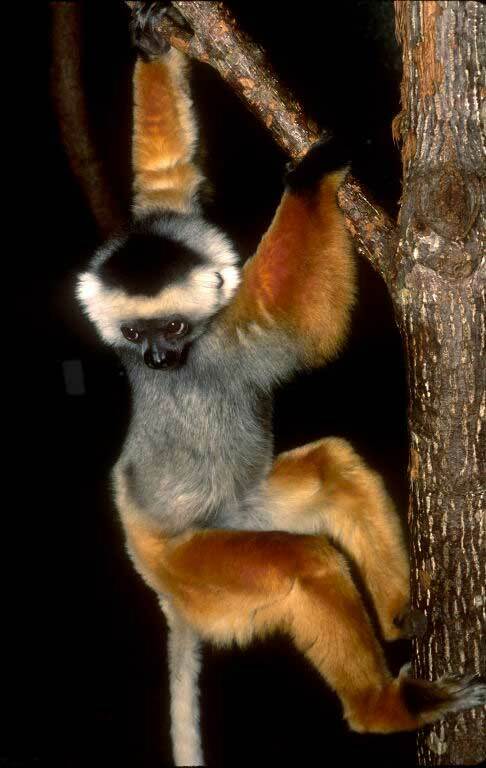 In the case of Propithecus this increase has mostly been due to 'subspecies' being redefined as 'species' but most of the Avahi species have been named within the last ten years, mostly distinguished primarily or entirely by molecular evidence alone. The avahis are small, mostly brown and grey nocturnal lemurs that might be expected to be morphologically conservative but still, I can't say as I'm entirely happy with the situation. Indri, Indri indri. Need I say more. Photo from here. However, there seems to be no basis for the oft-repeated claim that the "indri" is miscalled and that the name is actually Malagasy for "there it goes" or "look at that" or something similar. As explained by Hacking (1981), the mistake was attributed to the naturalist Pierre Sonnerat, one of the first Europeans to observe the indri. However, Sonnerat's experience with the indri was no brief encounter. Tame indri were often kept in the area in which he travelled (Markus Bühler, in a response to the "creepy Megaladapis" picture I posted here a while back, informed me of a probably-apocryphal claim that tame indris were used to hunt birds) and Sonnerat himself took one back to France with him. 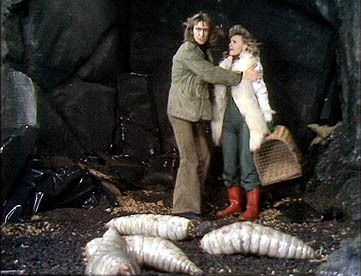 Hacking (1981) points out that it strains credulity that Sonnerat could have become so familiar with the animal yet never had anyone correct him on a basic point. It is more likely that, as with a similar story about the kangaroo, the legend has developed from a failure to consider that different groups of people may use different names for the same animal. The inside of an indri. Photo from here. Hacking, I. 1981. Was there ever a radical mistranslation? Analysis 41 (4): 171-175. Lei, R., S. E. Engberg, R. Andriantompohavana, S. M. McGuire, R. A. Mittermeier, J. R. Zaonarivelo, R. A. Brenneman & E. E. Louis. 2008. Nocturnal lemur diversity at Masoala National Park. Special Publications, Museum of Texas Tech University 53: 1-41. Marivaux, L., J.-L. Welcomme, P.-O. Antoine, G. Métais, I. M. Baloch, M. Benammi, Y. Chaimanee, S. Ducrocq & J.-J. Jaeger. 2001. 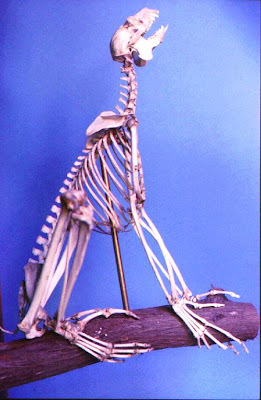 A fossil lemur from the Oligocene of Pakistan. Science 294: 587-591. Mittermeier, R. M., J. U. Ganzhorn et al.. 2008. Lemur diversity in Madagascar. International Journal of Primatology 29 (6): 1607-1656. 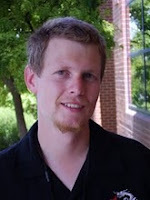 Nowak, R. M. 1999. Walker's Mammals of the World, 6th ed., vol. 1. JHU Press. Orlando, L., S. Calvignac, C. Schnebelen, C. J. Douady, L. R. Godfrey & C. Hänni. 2008. DNA from extinct giant lemurs links archaeolemurids to extant indriids. BMC Evolutionary Biology 8: 121. "Also noteworthy is the indriid dentition which has fewer teeth than any other primate family...."
Maybe you're getting out of this by using the word "family", but I am a primate with fewer teeth than that (without having lost any or had any removed). If I'm reading that right, that's a total of 30 teeth for indriids, and I have 28. (I lack "wisdom teeth".) Not the norm for our species but apparently not uncommon. I was thinking the same thing! Lack of wisdom teeth is norm for certain human populations, IIUC. I conceed the point. I had specifically tallied up against humans to make sure I was right, but I'd forgotten that some people naturally lack the third molars (in my case, they're there but unerupted). all I can say is "Zooboomafoo!" What about the aye-aye? It is always classified in a "family" of its own, and it has only 18 teeth: one incisor, one premolar (missing in the lower jaw) and three molars in each half of a jaw. Looks like I made a bit of a twit of myself :) I've corrected the post accordingly, and thanks to all for the corrections.